Isaiah 25.6-9 A vision of God’s salvation as a sumptuous feast for all people. Revelation 21.1-6a On Christ’s return God & humans will dwell together. John 11.32-44 Jesus sheds tears as he confronts death, but death loses. 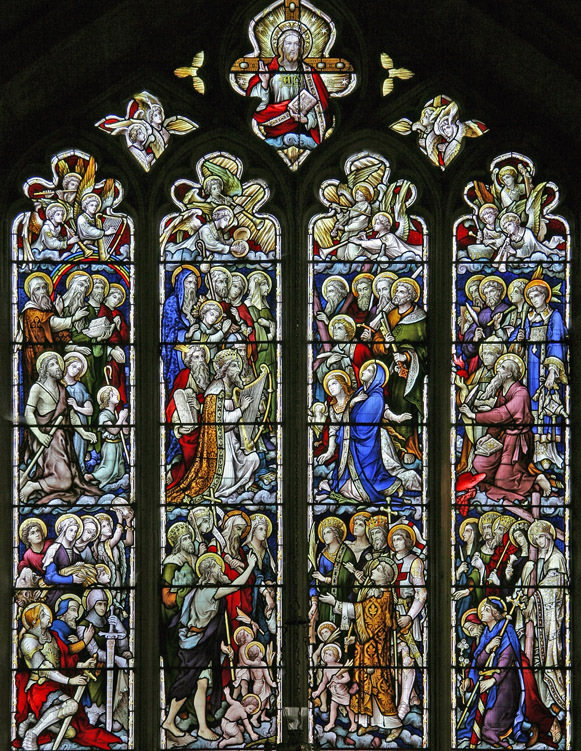 Saints & angels worship the risen Christ. All Saints’ church, Elton, Cambs. Our word “saint” translates the Greek word meaning “holy”. Does this image help show that all God’s people are holy “saints”, not just a few famous ones? – Isaiah envisions God’s ultimate salvation as a rich feast: Jesus often uses the same imagery – more specifically, a wedding feast (e.g. Matthew 22:1-10). – The imagery in Revelation can often seem strange, but it’s frequently taken from the Old Testament: here in chapter 21 there’s a clear link to Isaiah’s vision of the end of death, and God wiping away tears. – The Gospel (v33) has Jesus “greatly disturbed in spirit”, but this translation is quite tame. The word means “enraged, snorting with anger like a horse”. Such is the depth & force of Jesus’ reaction to death and how it affects his friends. 1 Peter 2:4-10 Peter calls God’s people a “holy priesthood” and a “holy nation” – alternatively ‘priestly saints’, ‘saintly nation’. Is this how we see ourselves? John 2:1-11 In the story of the wedding at Cana there are hints both of Isaiah’s “well-matured wines strained clear” and the New Jerusalem like “a bride adorned for her husband”. God’s presence completely transforms the ordinary. Psalm 56:8-11 It’s hard to comprehend that God cares enough about us and our emotions to keep our tears in a bottle – and eventually to wipe them all away. What other passages come to mind when you read today’s readings? – Give thanks for the promise of a new heaven and a new earth in which death and sin will be destroyed, and all their consequences will be redeemed . – Pray for the saints who are persecuted, including the Coptic church of Egypt this week: ask God to protect them, and give them courage and perseverance. – As we approach Remembrance Sunday on the 100th anniversary of World War I’s end, pray for all those in our communities affected by military action as current of former service personnel, or their families, especially those who have sustained life-changing injuries, either physical or mental. – It’s up to us to support those have been affected by military conflict, and to work towards a peaceful world. Whichever you donate to, please be generous. – As the evenings are suddenly darker, check your car (and bike) lights are working properly – for your safety and that of other road users.